Lately it seems like the ChromeBox has been taking the meeting room by storm. IT folks are seeing the ChromeBox as a simple and affordable option for a "Meeting Room" Computer. Google put together an attractive package called "ChromeBox for Meetings" built from the ChromeBox, a Logitech C930e and a Jabra Speak 410 microphone. Google also includes a "Google User License" and they made custom "Meeting Room Software" to make the room easy to schedule and usable for Google Hangout meetings. Much of the demand is driven by companies who are on the Google Platform for gmail and therefore unified communications. 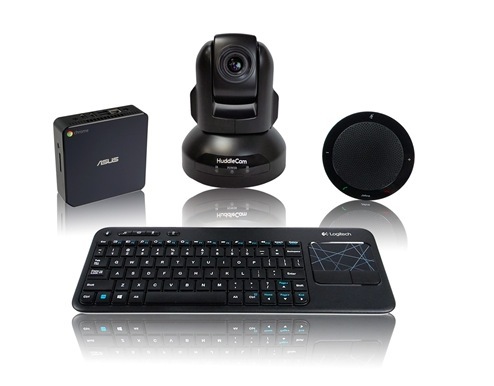 So the fact that these ChromeBox's are going into meeting rooms begs the question: Why bundle a desktop webcam? That camera is made for desktop video conferencing where users are literally 2-3 feet from the camera. Putting this camera in a large room makes the users look like ants and field of view is always way to wide.